My mother, an attorney, was the first person to teach me about res ipsa loquitur, a legal term that translates to “The Thing Speaks for Itself.” I will leave it to the lawyers out there to explain the finer points of how it’s used to prove negligence in the courtroom, but as long as I can remember, my mom and I have been translating it in a way that I feel certain it was meant to be translated. That is: If you are good enough, strong enough, fast enough, smart enough, nice enough, you don’t have to spend any time convincing people you are good enough, strong enough, fast enough, smart enough, nice enough. Those qualities should hopefully speak for themselves. The exception to this rule, as my kids know, is when you are my child and when you are home in your own house, at your own dinner table, or anywhere else for that matter, there is no such thing as too much speaking about yourself. You should feel free to tell your parents every single wonderful thing you think about yourself at all hours of the day. But everywhere else, you try to check the bravado at the door. My loose interpretation of this term has proven to be very convenient beyond the realm of parenting. Take the above 5-minute dessert you see above. My feeling is that you don’t need to hear 500 words from me about how delicious it is. Just look at the freaking thing! It’s a Nutella Pizza! And as such, res ipsa loquitur. I feel like I can’t walk two feet without seeing this offered on a menu. The lastest place I’ve spied it: The Cookery. Using a rolling pin, roll storebought pizza dough as flat as you can roll it. In a cast iron pan, heat 1 tablespoon of butter and a drizzle of canola oil over medium heat. Add dough and fry until it bubbles on top and looks golden and crispy underneath. Lift dough with spatula, add another pat of butter to the pan and allow to melt before cooking the other side of the dough. When it’s cooked through — another 2 to 3 minutes — remove from pan onto a large plate. Once it has cooled slightly, spread a generous amount of nutella on top and add sliced bananas or strawberries (we didn’t have them on this particular night) or both. Sprinkle with powdered sugar and cut into wedges to serve. You could also do this on the grill. Just make sure you brush the grates with plenty of oil. There have been some great comic books on kickstarter lately. I haven’t seen these anywhere, but maybe the craze hasn’t hit the Midwest yet. Or maybe I just don’t get out much. But this post popped up in my reader just as I ate the last bite of a leftover waffle with Nutella. Now I know what to do the next time I have extra pizza dough. My children will bow down and worship me. Thank you in advance. I’m an attorney as well, and I agree totally – this little dose of awesome just speaks for itself. I’m going to make this as soon as I go buy some pie dough! 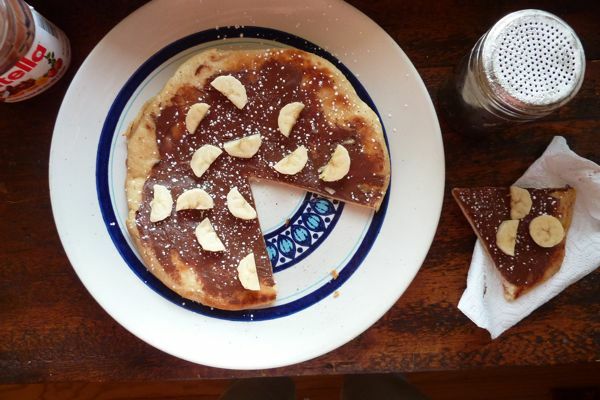 Who would’ve thought to put Nutella on pizza..
Nutella pizza, new to me. Looks so delicious. + Fun to see your book as a suggested hostess gift in a Real Simple magazine article this month! Well said! And to adhere to the principle of less is more, I will say only this: Gorgeous! Amazing. My son would go crazy for this! Think it will be the perfect treat after a t-ball game. My daughter loves Nutella. She will be so excited to make her own Nutella pizza. Thanks for sharing the great idea! Lovely! Fresh raspberries and blackberries would go so well on top of this.